Donovan has been gardening since he was 16 years old. “I learned up north in a foster home on a farm/ranch in the Standing Rock Sioux Reservation." 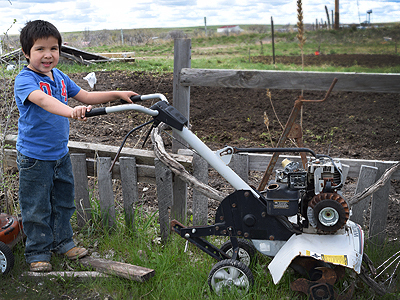 Donovan is a gardener in the northeastern community of Wanblee on the Pine Ridge Indian Reservation. When we arrived at Donovan’s home, we noticed a gas tiller resting on the outside of the wood fencing surrounding the designated garden area. “The tiller doesn’t work and I can’t get parts for it anymore,” Donovan clarified. Having the tiller go over his garden area saved him a lot of time. “I appreciate it. It’s going to help me — usually we do this ourselves and with two of us turning the soil, chopping up the dirt clumps, it takes three days if we do it all together,” he said. He has been gardening since he was 16 years old. “I learned up north in a foster home on a farm/ranch in the Standing Rock Sioux Reservation. We did a lot of farming and haying,” Donovan explained. His house was full with three children and three grandkids, so the garden would help feed his family with healthy food. PWNA has been tilling gardens through our Northern Plains Reservation Aid™ (NPRA) program since 1994. In the past five years, we have tilled just over 500 individual gardens on three reservations. During this same time period, an average of 10 community gardens have been tilled in five reservations each year. 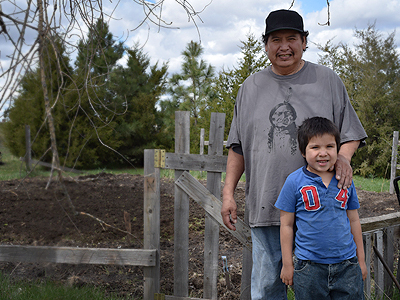 Donovan was actively passing on his garden skills to his 5-year-old grandson, Jaren, Jr. It was clear from the increase in tiller tractors traversing reservation lands, tribal members were serious about food sovereignty. Any failed gardens were typically the result of the elements — hail mostly — not the will and the hard work of the gardener. We also coordinated with other organizations supporting gardens to produce more tilled gardens in additional communities with the ultimate goal of harvesting more food. Concentrated, cooperative efforts are necessary to support families and communities fighting the health and nutritional impacts of living in a food desert. PWNA typically tills a 20x40 area — 800 square feet — for individual gardeners, but may consider tilling a larger lot with compelling circumstances. Donovan’s family size of eight was compelling enough. Produce yield estimates for gardens differ depending on the vegetables being grown, but one online estimate suggests that for every 200 square feet will produce a season’s worth of produce for one person. Based on this estimate, an 800-square-foot garden will feed a family of four. Based on that information, PWNA tilled an additional area for Donovan and his family.